After many years of standing-room only crowds and rave reviews, the wildly popular “60 Sites in 60 Minutes” is ending its run at the annual SLA Conference & INFO-EXPO this year. Hosted yearly by SLA’s Legal Division, 60 sites features a fast and furious exploration of some of the hottest and hippest sites for information professionals. If you want to get a seat, you are going to want to get their early. 60 Sites in 60 Minutes is a labor of love produced by John DiGilio of Reed Smith LLP (A.K.A., iBraryguy) and Gayle Lynn-Nelson of LexisNexis. They have been collaborating on this session for several years now and have been humbled by the overwhelming response it has received. No matter how big the room has been, there has never been enough seats. Attendees have literally sat on the floor between sections and stood several deep in the back of the room. 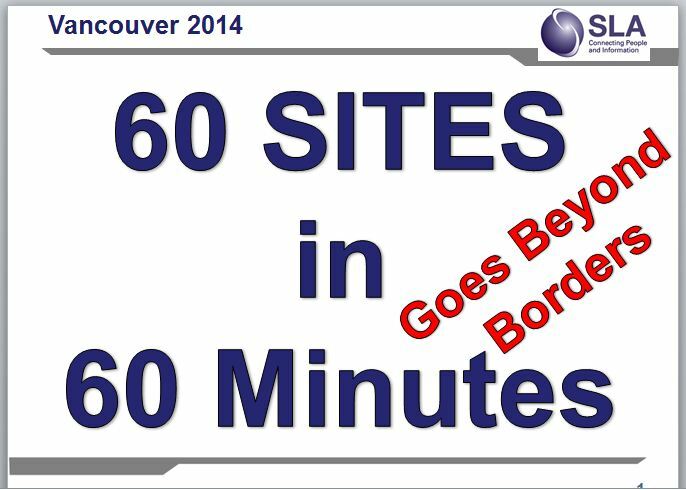 60 Sites in 60 Minutes: The Last Dash!